When the Creator came to his creation and dwell as human among other Jews, Jesus Christ, was rejected in every place, except for one. 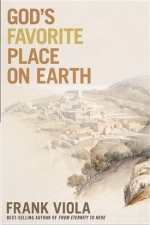 Frank Viola wrote God’s Favorite Place on Earth about that one small village, Bethany, just outside Jerusalem, and home to Simon the leper, Lazarus and his sisters Mary and Martha. Main narrative is from the viewpoint of Lazarus. Jesus’ many visits to Bethany and his encounters with this family inspire believers globally struggling with fear, suffering, the object of our worship, rejection, healing and resurrection. With intermezzos to step outside the home and village and review the exact biblical verses, the bigger picture, it’s more than a paraphrase of a couple of famous stories in the gospels. Viola’s referring to his other books on Jesus Christ, the eternal plan God has with his children and the hope Bethany still holds for us today. Because it was from Bethany Jesus Christ ascended to heaven and promised to return to this very place. Well-written, a warm and personal narrative, and provoking thoughts. A series of group study questions are added for further reflections. Frank Viola is is a blogger, speaker, church planter, author, and consultant to writers. He is is the bestselling author of God’s Favorite Place on Earth, From Eternity to Here, Jesus Manifesto, Reimagining Church, Jesus Now, and Jesus: A Theography.